This Provençal style house sits on a small lot, close to the street and neighbors, so privacy was a primary design consideration. At the front of the house, a crushed stone parking court is separated from the street by a wall of magnolias while garden walls provide privacy and enclose lush gardens along the sides and back. Locally quarried fieldstone was used at the exterior with Indiana limestone accents around the doors and windows. 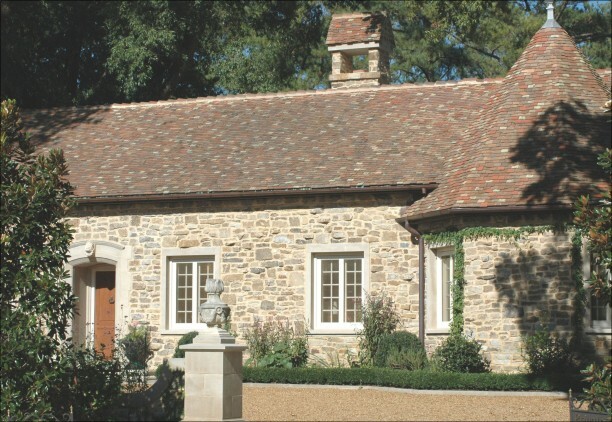 The roof tile was selected from old French tiles and was shipped to the site for installation in the traditional French manner. Broken shards of roof tile were crushed and added back into the crushed stone paving at the parking court. Ornamental limestone pieces, purchased in France, were used as accents in the exterior walls of the house and an antique French limestone mantel is framed into the stonework of the dining porch. The front door was purchased in France and the ornamental light fixtures were designed and fabricated in Paris.